Pratik calls himself a social entrepreneur who often gets himself involved in things that can change the world. If you combine a business school brain with a social worker’s heart then you get Pratik Shetty. He has an expertise in entrepreneurship, leadership and innovation management. He has a bachelor’s degree in business and commerce. Soon after completing his degree he jumped on to entrepreneurship bandwagon with his first startup, the learning reinvented foundation. 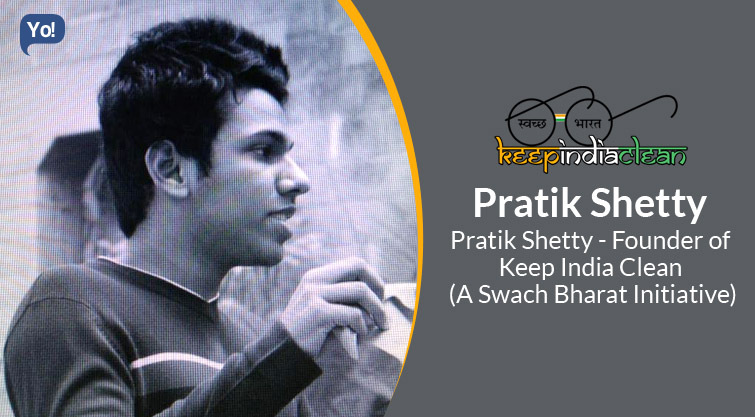 However, he came to the forefront with his second venture called keep India clean. They collaborate up with local cafés and restaurants and ask them to maintain a dustbin just outside their premise. An entrepreneur is busy being concerned about his profits, an employee or a professional is busy being concerned with his next promotion and raise and the students (youth) are busy worrying about their exams. Everyone is busy with their own lives. That’s where the problem lies in. Cleaning your surroundings, cleaning India is actually a simple task but for that, people have to put a conscious effort to it. I am a social entrepreneur. My main focus is on edu-tech, however seeing the condition of the streets in India, I wanted to do something about it, so I started off with Keep India Clean. Understanding Oneself, Connect with a few selves and Serving all. Raising awareness of the movement is definitely one of the biggest challenges at present. Our growth to 25 cities has been completely organic, without any advertising, and without any press coverage. To raise, more awareness of the movement, we are now getting in touch with media entities. The Swachh Bharat Abhiyan had a major role in changing the mindset of the people. People want to see a cleaner India, but don’t really know how to go about it. That’s where Keep India Clean comes into the picture. So, we got all our work cut out by the Nationwide Swachh Bharat Movement. We have followed a very unconventional model for our NGO. Unlike tradition NGOs, we do not have registration forms, we do not conduct interviews, and anyone can become a volunteer of Keep India Clean, if they are able to convince five restaurants in their area to maintain a dustbin outside their premises. Our Motto is “Membership by Action”. There are 5 steps mentioned in the Keep India Clean website (www.keepindiaclean.in), if you are able to complete the 5 steps, you become a member of the movement. This Decentralized Approach has been the key to our success and a decentralized model does not require any big investments. I would personally recommend “Pocket” for Bookmarking / saving articles, videos, and websites across all platforms. Slack and Asana are great tools for communication and project management respectively. Getting up early is that one habit I guess, because you have more time do everything. I wish I could get up early in the morning, which as per my own advice will make me more productive. Stop thinking about success. There is no such thing as success in Life. Just follow your passion and everything will alright. No one must think they know everything about something. There is always room to learn. If you are not learning something new every day, then you are doing something wrong. The most important lesson I learnt till now is that, you don’t need to any resources or money to help other human beings. All you need is a “human heart” i.e. the will to do it and you can make a big difference if you just start doing it. My goal in life is to come up with – a global education system, eradicate world poverty and bring back wisdom in our society. All my initiatives, which I have started (including Keep India Clean), and the initiatives I will start, be based around these three principles. For Keep India Clean – You can expect it to be your one-stop portal for all activities that you can do to make your surroundings clean and India beautiful. If you knew the mistakes to the exam paper you just gave, would you go write the paper again or make note of it and use it to improve on your next exam? You cannot learn anything without making mistakes. So I would really not click on the “Restart your career” button, rather learn from the mistakes I made and apply that knowledge in the future. “Do not say, ‘It is morning,’ and dismiss it with a name of yesterday. See it for the first time as a newborn child that has no name.” – Rabindranath Tagore This one line has more meaning than an entire book.